Rhode Island never ratified the 18th Amendment. With its 400 miles of open coastline, rum running was a thriving industry for its residents. The Flying Horse Carousel is the nation’s oldest carousel is in the town of Watch Hill. The state of Rhode Island is located within the New England area of the United States and is the least extensive state in the country with a total land area of only 1,214 square miles, as well as the 8th least populated with a total population of 1.05 million, however it is the 2nd ranked most densely populated state. 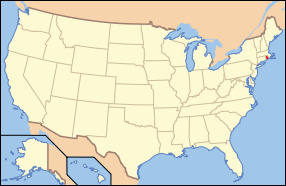 Rhode Island is bordered by Connecticut, Massachusetts, and shares a water boundary with Long Island. Additional water boundaries include the Narragansett Bay, Atlantic Ocean, and Rhode Island Sound. It was also the first of the 13 original colonies which declared its independence from the British ruling, and was the last to ratify the U.S. Constitution. The capital of Rhode Island is Providence which is also the states largest city. Rhode Island is said to have gotten its name either from the Isle of Rhodes located in the Mediterranean Sea or for the red clay prevalent in the state. Rhode Island is nicknamed “The Ocean State” which is a reflection of the geography of the state which consists of numerous large bays and water inlets which make up roughly 14% of the states total area. The climate in the state is recognized as humid continental and experiences warm and rainy summers with cold or chilly winters. The highest recorded temperature in the state was 104 degrees Fahrenheit on 1975, and the lowest was -25 degrees Fahrenheit in 1996. The major industries in the state include jewelry, rubber products, textiles, tourism, and machinery. Rhode Island has a few major bodies of water which include the Sakonnet River and Scituate Reservoir. The highest point of elevation in the state is Jerimoth Hill which peaks at 812 feet above sea level. 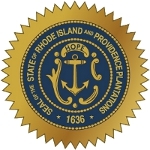 The state motto is “Hope” and the state song is “Rhode Island, It's For me”. The state bird of Rhode Island is the Rhone Island Red, the state flower is the Violet, and the state tree is the Red Maple Tree. While Rhode Island may be the smallest state in the country, it has a busy economy which is comparable to larger states, and thus it is an important part of the overall U.S. Economy.